The Prince of Wales has officially opened a women's clinic offering both conventional and alternative therapies in the model village he helped design. Prince Charles, a long-standing supporter of complementary medicine, opened the Poundbury Clinic, on Middlemarsh Street, Poundbury, Dorset. Medical staff use yoga and homeopathy alongside traditional medicine to treat problems such as infertility and PMT. 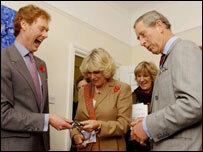 The Prince was joined by his companion Camilla Parker Bowles for the visit. Unveiling a plaque, Prince Charles said it was sensible to use "the best of the ancient and modern in a more harmonious way". He said that in many ways "we are what we eat", so nutrition and diet was of "enormous importance". The Prince said that Poundbury was designed to encourage people to walk around to the shops or to work, encouraging a healthier lifestyle. The construction of the Dorchester village began in 1993 and is planned to last a total of 25 years. In July, leading cancer expert Professor Michael Baum, of University College London, said Prince Charles had "overstepped the mark" by promoting some alternative treatments. The attack came just weeks after the Prince suggested a controversial diet had helped one woman to beat cancer.